Washington - The Justice Department’s investigation into Hillary Clinton’s email setup has been formally closed without any criminal charges, Attorney General Loretta Lynch said Wednesday. Comey, in an unusually detailed and public accounting of the investigation Tuesday, said “no reasonable prosecutor” would pursue a criminal case and said he was advising the Justice Department against bringing any charges. But he also rebuked Clinton, who relied exclusively on a private email server as secretary of state, and her aides for being “extremely careless” with their handling of classified information. “There is evidence to support a conclusion that any reasonable person in Secretary Clinton’s position ... should have known that an unclassified system was no place” for sensitive conversations, Comey said. FBI agents spent the last year investigating the matter following a referral from the intelligence community’s inspector general. As part of that investigation, investigators pored through tens of thousands of State Department emails and interviewed top Clinton aides — and finally, Clinton herself this past weekend. “No charges are appropriate in this case,” he said. Though she said she had already settled on that process, the announcement came just days after she had an unscheduled meeting with Bill Clinton aboard her plane in Phoenix. 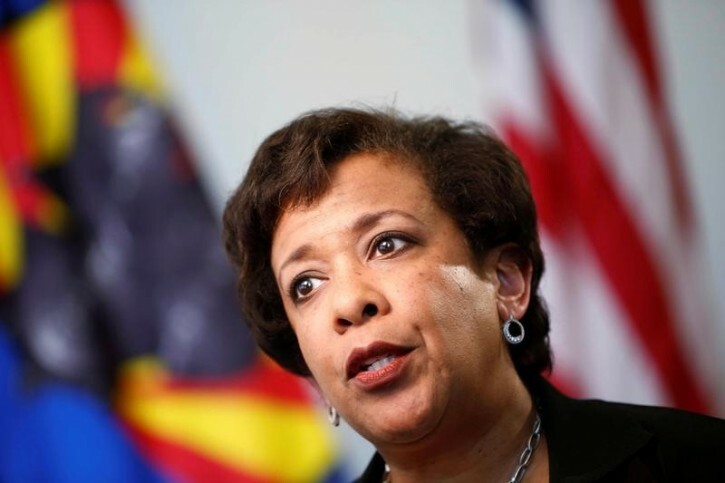 Lynch said the investigation was not discussed, but she acknowledged that the meeting had “cast a shadow” on the process and led to questions about the independence of the investigation. Dumb and Dumber! Lier and Bigger Lier! If it were you or I, we would be in Jail by now, no doubt! She knowingly had the 'highest level of security' emails on her private server, marked as such (thus, she knew about), and jeopardized the USA, and she isn't in jail??? She wouldn't pass a BASIC security/background check to work as a Janitor in the State Department because of her "extreme carelessness" with highly classified information, and she can run for President???!!! Only morons (Democrats) would vote for her! This is a bad day for America. This disgraceful hateful woman sold the American people long ago, all for power and greed. She's worse than her awful husband, she's as bad as Obama. Siblings from different mothers. That meeting o the tarmac evidently went well for the Clintons. I propose the US government make a name change. The currently titled "Department of Justice" should be renamed "Department of Political Overlook". I can think of a few permutations of that, and I encourage others to share their ideas. The entire Obama administration is the most corrupt in history! Did anyone ever really believe, that after Obama endorsed Hilary for president WEEKS AGO, that he made sure she wasn't going to get indicted?!?! How dumb the American people are....but that was obvious when they voted for this nefarious muslim-sympathizer twice.